The UFC has stripped Jon Jones of his light heavyweight title and taken him off the headlining bout at the upcoming UFC 187, but that is not the only thing the now former champion has lost. 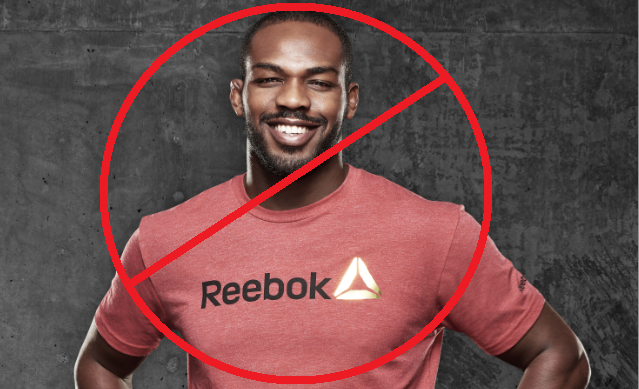 “In light of recent events, we have made the decision to terminate our contract with Jon Jones, effective immediately,” read a statement from Reebok an official sponsor of not only the UFC, but also Jones as an individual fighter. Currently Ronda Rousey, Anthony Pettis, Johny Hendricks, Paige VanZant, and Conor McGregor still have a sponsorship deal with Reebok separate from the UFC’s organization wide sponsorship deal and uniform partnership with the company. This is the second time in less than a year that Jones has been dropped by an apparel brand. Back in September, Nike severed ties with Jones not long after his on-stage brawl with Daniel Cormier. While he initially said Nike parted ways because of the incident, he later retracted that comment and said that Nike no longer wanted to be a part of MMA.